Every diving organization offers within its course structure a programm that successfully qualifies the candidate to guide certified divers in open water. Details for the PADI Divemaster Course which is part of this group of courses, can be sent on demand. Why should there be a special course for guiding divers in the cavern area respectively in the cave area (if they have the corresponding training)? Divers with minimum Open Water Certification can experience the cenotes of the Riviera Maya with a guide. They learn a completely new dive environmet, diving without a direct ascent to the surface, the overhead environment. The guide needs to be able to explain all necessary emergency procedures and why it changes in the overhead environment, but this is such a specialized aspect and a dive master, if (s)he has been trained as a cave diver, has not necessarily learnt this during his/her cave course. It is of course a great advantage if the recreational diver knows the differences for cavern diving versus open water versus cave. Although every technical diver should be capable to plan and dive his/her cave dive, there is an advantage to have a local guide to buddy up with (suitable choice of dive site, knowledge where to go, emergency equipment etc.). 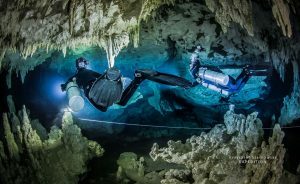 The guide on the other side has always to consider that technical divers with varying training levels and certification levels arrive and would like to or are able to dive caves with different levels of difficulty. The guide must be in a position to evaluate the diver in the beginning and to create an adequate plan for the day that pays respect to the wishes of the client as well as safety and cave conservation. At the moment only a well trained cave instructor fulfills these requirement for BOTH of guided dives in the caverns and caves. Experience and not only course dives are prerequisite as a minimum. Request with your booking a log of the experience of your guide and help us to make diving in the cavern and caves of the Riviera Maya safer. Only if the customer knows what to ask for, can we create the grounds for change. Stefan Pape is a professional cameraman and sport diver from Germany who made a great documentary about the Riviera Maya. This documentary is only in German and if you are interested to order, please follow the links on the German page. The appartment has two bedrooms and non-diving partner can be booked in additionally. Come and enjoy beautiful Playa del Carmen, experience the city, get the spirit, come diving, dine out in the evening or stay at home. You will stay in Casa Ciricote, a small vacation rental property in the middle of Playa del Carmen, on calle 28 with Avenida 25. Your place is only 5 min away from the best restaurants on 5th Avenue. The public beach is just 3 min more to get to. The house has a swimming pool. The rooms are equipped with DCD/CD player, TV, fully furnished modern kitchen, a living room, towels and linens, each bedroom with own bathroom, AC and ceiling fans, internet. Additional services such as catered meals or the maid service (for additional charges) available. You will be picked up each morning from your home and get to the dive sites. No worries for long walks and no hassle with the equipment. Just leave it to us. Please inquire for your package if you are a smaller/ bigger group or if you are a single traveller. Cave Weeks with us; we celebrate because the web page is online! Confirmation: after confirmation of the date, a deposit is necessary to confirm from your side. the special offer: this price is valid even if you do only one diving day with me. Choice of dive sites depending on experience level and in accordance with the divers. If two cave divers book in for the same day, the dive site will be chosen considering the less experienced diver. Done a course with me? Back in the old times? No worries, even I do not work full time in a dive shop anymore, I will grant you the same price structure that we agreed on and was the rule with that dive shop. This special deal means that if you started a technical course such as Cavern Diver TDI for example and want to continue to Intro-to-Cave or Full Cave all you pay is the price difference for the upgrade. My price structure in total may vary now a little bit, but still you have the advantage of a repeat customer which I want to honor. I appreciate you coming back. So let’s go diving. Just inquire for YOUR price today!